Today I am writing with a heavy heart. This morning I took my almost 12 year old son to a funeral. The funeral was for a healthy, vibrant 40 year old woman whose daughter is in my son's class. It happened fairly suddenly and was a shock to everyone. She was a wife, a mom to 2 intelligent kids, and a para at the elementary school. Many people are struggling with this loss. It is hard to understand why people who are so young and with so much life to live pass away. I can be sure we will never understand this. My heart is breaking for this sweet young girl who has lost her mom. On our way home I was thinking about how short our lives here on Earth can be. Am I taking advantage of every day or am I whining & complaining about what my kids are doing? I am definitely not taking advantage of every day. I need to hug & kiss my kids more and be frustrated with them less. I need to make better use of the time I have. I also need to make sure my kids see me spending time in God's Word, deepening my relationship with Him. I want to leave a legacy like the one my Grandma left, but I have a LONG way to go to do that. I just have so much on my mind & heart today - but the one thing that is very clear to me is that I need to have my life right with Christ. I need to spend some time on my knees asking for forgiveness and seeking after Christ and what he has for my life. Hug your kids an extra time or 10 today. To any of my friends and family thinking about getting me something for my birthday, think about donating some money to my local Library. They are working on renovating the building and could definitely use any extra money! I was inspired by the young mom whose funeral we attended today, she was very involved with their library and she loved helping kids learn to love reading. I don't need any "stuff" and this gift would be something that would keep giving! 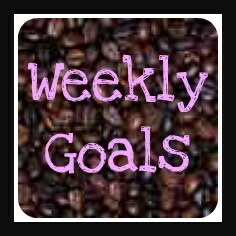 Normally I would put the Weekly Goals image first, but I have something so much more exciting this week! I GOT A DISHWASHER! I have been without one for almost 4 years, well I have 3 but they all seem to be broken. One of them does work, it's just sporadic (love you Bill!). This is such a big deal for me, it will save so much time and be easier for me to keep up with the dishes! Can you tell I'm excited? Now to teach the kiddos to load it, already training G! WooHoo! Well I didn't do super awesome last week but also not horrible, considering the amount of time I spent at the kids' school or at school activities last week! Plus getting ready for the garage sale, which ended up being very lucrative (partially due to the 18 pints of pickles I sold!). We were able to pay for G's Jr High Camp and purchase a family pool pass! 2. Complete a marriage challenge (more about this next week) -- going to have to wait on this a bit, life got super crazy & stressful last week. 7. Trial wedding cake -- made up the recipe in cupcake form and it was a hit!! This is the last full week of school and I am trying to take advantage of every quiet moment!! We have also started our crazy expensive month starting with Mother's Day (though all I wanted this year was relief from my daily chores - it was awesome!) and after 5 birthdays (3 of those being Bill's, mine & G's) a graduation and a wedding it will end on Father's Day. Whew! 1. Make a list of things to keep the boys entertained this summer so they have less time to argue! 2. Do something every day to let my husband know how much I appreciate & love him! 4. Exercise! Be active every day. Looks like I have much to accomplish! Fortunately keeping up on dishes will be so much easier!